Harward Sisters is a family owned and operated purebred Angus operation located in Stanly County, North Carolina. What started as junior show projects for the Harward Sisters developed into a Registered Angus herd managed by the Harward girls. We strive to produce eye-appealing cattle that will succeed in the show ring but more importantly produce and excel in the pasture. We consign cattle to various sales throughout the year as well as market cattle private treaty off the farm. We will sell about 15-20 Angus, SimAngus, and Red Angus bulls a year. We also market select groups of open and bred heifers throughout the year. Potential show heifers are part of this group of open heifers. We love to work with juniors who are interested in showing cattle whether they have shown for many years or are just starting out! Angus cattle make up the majority of the Harward Sisters herd; however, Simmental, Red Angus, and Charolais genetics are also utilized. The Harward family also owns and operates an Angus-based commercial cow-calf operation in Stanly County, North Carolina. Rocking H Cattle Company consigns feeder calves to the Norwood-area feeder calf sales at Stanly County Livestock Market as well as in truckload lots of calves to the monthly Mid-Atlantic Cattle Sales video auctions. Replacement heifers are sold in special sales in the fall and spring. The Harward family is active in local, state, and national organizations. Marcus and Patty are past advisors of the NC Junior Angus Association and are current members of the Stanly County Cattlemen's Association, the NC Cattlemen's Association, the NCBA, and other agricultural organizations. 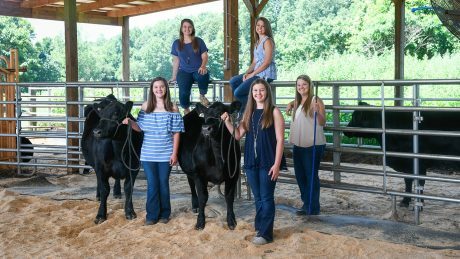 The Harward Sisters are active members of the NC Junior Angus Association, the National Junior Angus Association, the NC Junior Charolais Association, the Junior Red Angus Association of the Carolinas., and the NC Cattlemen's Association. They are also active in 4-H, school organizations, and school sports. Thank you for your interest in the Harward Sisters cattle operation. If you have any questions please contact Brooke Harward, 704-322-9770.